Mypsychonails: Tools for nail art!/ Instrumente pentru arta pe unghii! 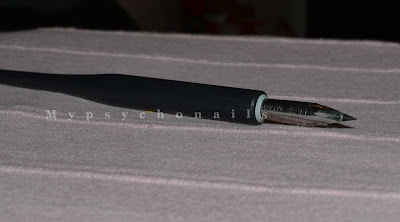 Tools for nail art!/ Instrumente pentru arta pe unghii! 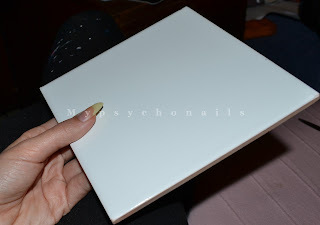 This new category will contain posts about various nail art techniques, materials and tools, brushes etc. Aceasta noua categorie va contine postari despre diverse tehnici de arta pe unghii, materiale si instrumente, pensule, etc. 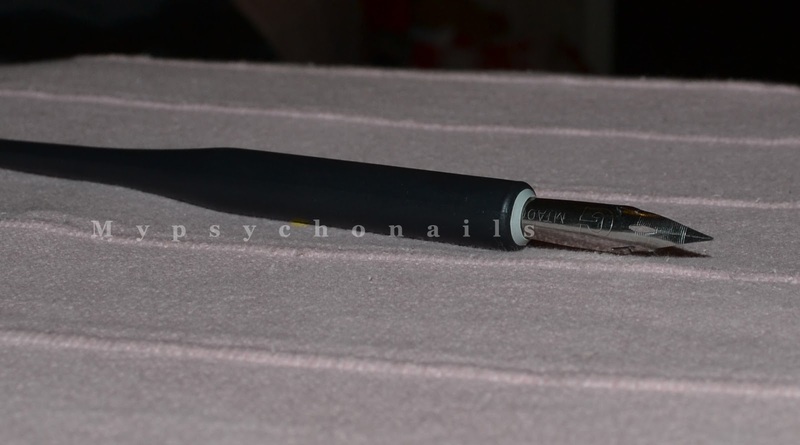 This first post is about the tools you can use for nail art. I initially included brushes too but when I saw how gigantic the post had became I thought dividing it would be a better idea. Aceasta prima postare este despre instrumentele pe care le poti folosi in arta pe unghii. Initial am inclus si pensulele dar cand am vazut cat de gigantica devenise postarea m-am gandit ca e o idee mai buna s-o impart. 1. a) A set of various sizes dotting tools is the number one thing to get. They are a must-have! Of course, they are mainly used for dots but you can also do lines, leopard print and even draw not-too-detailed stuff. 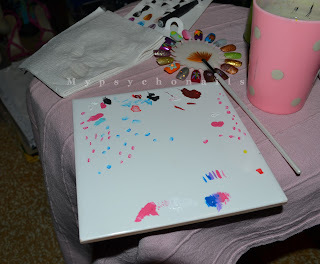 Use them with acrylic paint or nail polish and don't forget to clean them afterwards. You also need these for placing decorations such as rhinestones, studs, hexagonal glitters, 3-D pieces. Ebay is the best place to buy this set - it is very cheap and the quality is good. b) Un set de instrumente pentru puncte de diverse marimi este primul lucru de luat. Must-have! Bineinteles, sunt mai mult folosite pentru puncte dar poti face si linii, imprimeu de leopard si chiar desena chestii cu mai putine detalii. Foloseste-le cu vopsele acrilice sau oja si nu uita sa le cureti dupa aceea. Ai nevoie de ele si pentru a plasa decoratiuni ca pietricele, tinte, glittere hexagonale, piese 3-D. Ebay este cel mai bun loc de unde sa iei acest set - e foarte ieftin si calitatea este buna. 2. a) A spatula - optional. 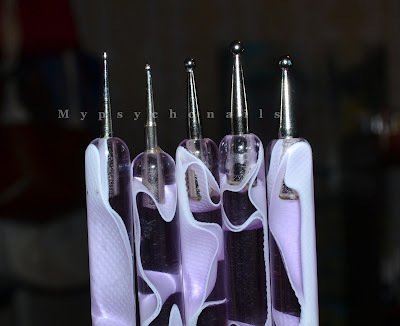 I use it to get the acrylic paint out of the tube because I don't like wasting it :P For this purpose you can also use a metal cuticle pusher. Also useful for mixing colours. b) O spatula - optional. Eu o folosesc ca sa scot vopseaua acrilica din tub pentru ca nu-mi place s-o irosesc :P In acest scop poti folosi si un betisor de cuticule din metal. Util si pentru amestecarea culorilor. 3. a) A ceramic tile - optional. Use it as a painting palette. Clean it with alcohol or nail polish remover after use. A piece of cardboard is another option. b) O placa de faianta - optional. Foloseste-o ca paleta pentru pictura. Curat-o cu alcool sau cu dizolvant pentru oja dupa folosire. O alta optiune este o bucata de carton. 4. a) A nail art pen - optional. For this type of tool you need paint jars (which I don't currently have), not tubes. Mine is a cheap one I got from Ebay but I want to get this one from Creative Ten. It looks like it is a good quality tool and they also carry paint jars which is convenient. This pen is useful if you find drawing with a pencil easier than with a brush. 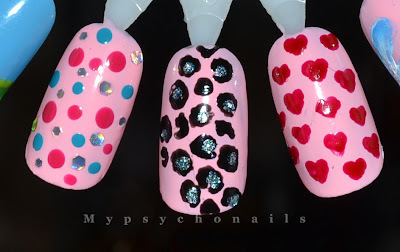 This is how to use it - Be Creative - nail art pen tutorial . b) O penita pentru pictura pe unghii - optional. Pentru acest tip de instrument iti trebuie vopsele in borcanele (deocamdata eu nu am), nu tuburi. Pe al meu l-am luat de pe Ebay si a fost ieftin dar vreau sa il iau pe acesta de la Creative Ten. Pare a fi de buna calitate si au pe site si culoare in borcanele ceea ce e convenabil. Aceasta penita este folositoare daca ti se pare ca e mai usor sa desenezi cu un creion decat cu o pensula. 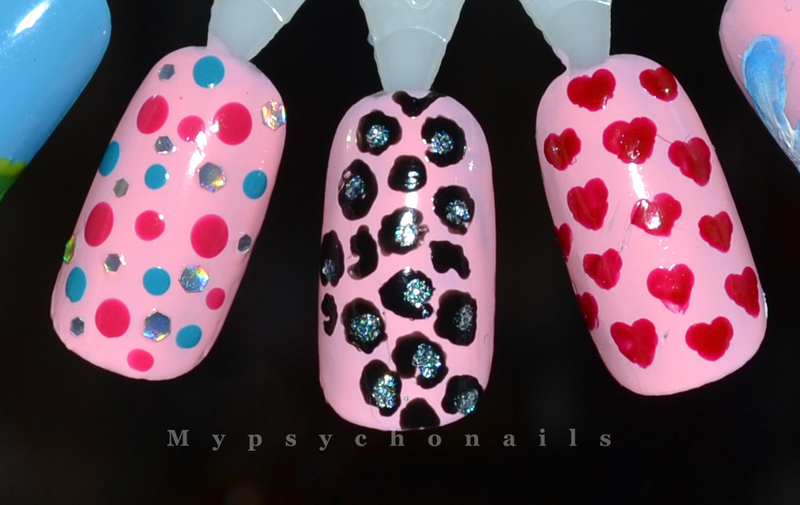 Asa se foloseste - Be Creative - nail art pen tutorial . Hope you liked this post :) See you soon for the rest of the story! Sper ca ti-a placut aceasta postare :) Ne vedem curand pentru restul povestii! Acea penita pentru pictura mi se pare geniala. Cand iti iei si acrilicele lichide sa ne faci o demonstatie. Abia astept sa vad ce-ti iese.